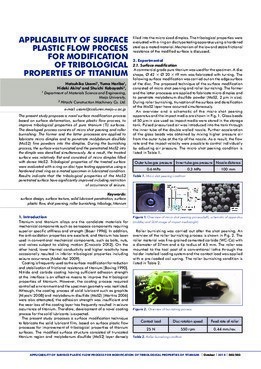 The present study proposes a novel surface modification process based on surface deformation, surface plastic flow process, to improve tribological properties of pure titanium (Ti) surfaces. The developed process consists of micro shot peening and roller burnishing: The former and the latter processes are applied to fabricate micro dimples and to penetrate molybdenum disulfide (MoS2) fine powders into the dimples. During the burnishing process, the surface was truncated and the penetrated MoS2 into the dimple was densified simultaneously. As a result, the treated surface was relatively flat and consisted of micro dimples filled with dense MoS2. Tribological properties of the treated surface were evaluated with a ring on disc type testing apparatus using a hardened steel ring as a mated specimen in lubricated condition. Results indicate that the tribological properties of the MoS2 penetrated surface have significantly improved including restriction of occurrence of seizure.